Instant Help Publications, 9781626255906, 176pp. Stop comparing yourself to others--you're special just as you are In this fun, practical guide, you'll learn how to silence your nit-picky inner critic, cultivate self-compassion, and discover what really matters to you. 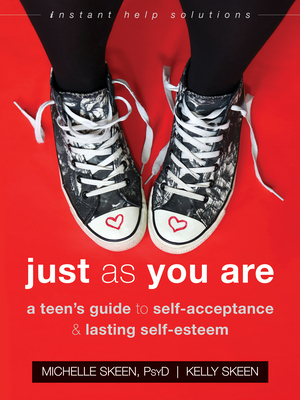 If you're like many teens, you probably feel pressured to live up to the impossible standards set by our culture, the media, and even by your peers. After all, everyone wants perfect hair, a perfect body, cool friends, and good grades. But while it's okay to strive to be your best, it's also easy to get caught up in a never-ending comparison game that can feed your inner critic and rob you of your happiness. So, how can you break free from negative self-criticism and learn to appreciate your strengths? In Just As You Are, psychologist Michelle Skeen and her daughter, Kelly Skeen, offer simple tips to help you overcome feelings of inadequacy and unworthiness, stop comparing yourself to others, and be more open and accepting of all aspects of who you are. You'll also learn how to be more aware of your thoughts and feelings in the moment using powerful mindfulness tools, and build a plan of action for the future based on your values. Sometimes it's hard to see yourself with clarity and kindness. With this important guide, you'll learn to move past your faults, celebrate your true strengths, and discover what really matters in your life. What are you waiting for? Michelle Skeen, PsyD, has a doctorate in clinical psychology. She is author of seven books, all designed to enhance relationships by emphasizing the importance of identifying core values and valued intentions, limited thinking, mindfulness, self-compassion, empathy, and effective communication and conflict resolution skills. Her passion is coaching individuals in creating and maintaining healthy relationships by bringing awareness to obstacles (fears and beliefs), which often work unconsciously to limit connections with others. Michelle believes that an early introduction and education in core values and healthy communication are essential life skills for success. To that end, Michelle and her daughter, Kelly, coauthored Communication Skills for Teens and Just As You Are. Skeen completed her postdoctoral work at the University of California, San Francisco. She codeveloped an empirically validated protocol for the treatment of interpersonal problems that resulted in two books: Acceptance and Commitment Therapy for Interpersonal Problems and The Interpersonal Problems Workbook. Michelle's work has appeared in more than thirty publications around the world. She hosts a weekly radio show called Relationships 2.0 with Dr. Michelle Skeen that airs nationally. To find out more, visit her website at www.michelleskeen.com.Kelly Skeen is a recent graduate of Georgetown University in Washington, DC. As an American studies major, she concentrated in art and museum studies, and plans to pursue a career expanding access to the visual arts. She is also coauthor of Communication Skills for Teens with her mother, Michelle Skeen. Skeen strives every day for greater self-acceptance and to embrace who she really is! To learn more, visit her website at www.kellyskeen.com.